I turned my laptop on today in an attempt to write a review about a book I just finished reading. 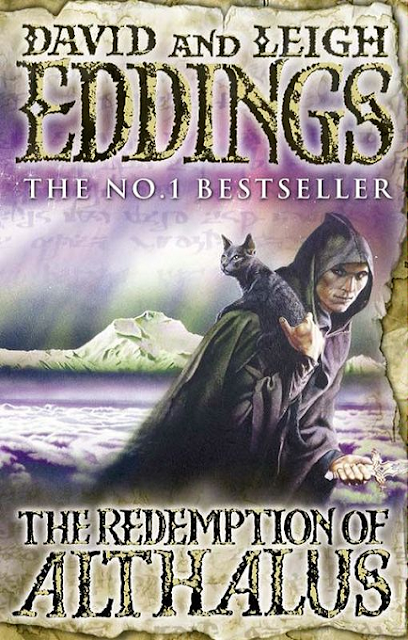 It's called the Redemption of Althalus, by David and Leigh Eddings, and, barring the Lord of the Rings (due to what it stands for personally, not just the story), it is now my favourite book. I'm actually good at writing reviews. I did very well in school with it, but I'm just too distracted right now, because as soon as I finished the last page, I picked up another book that I'm glued to. So I'm going to put it to you simply: humour, thieves, real gods, unique magic, a real jumble of different characters, a house at the end of the world, and doors that lead to anywhere and anywhen and are invisible to everybody save for one person. It's 900 pages of pure amazingness that I would recommend to anyone who hasn't read it. Now as far as I'm concerned, I'm finished here. Back to The Diamond Throne. I own EVERY SINGLE book written by David Eddings. I read this book a long time ago and it is very good. If you havent yet you should try his earlier works like the Belgariad. (so much better). I read all of his books at least once a year.